The Alternative Reef specializes in producing the marine hobbyist and commercial marine industry with ceramic propagation plugs, disks and frag holders. We bring over 28 years of experience in the freshwater and marine hobby and seven years in the marine industry. 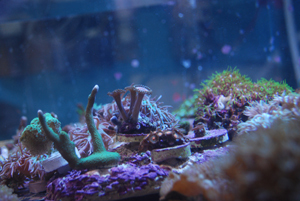 We spent three years as a professional coral farmer and retail store. Many of the aqua cultured corals we introduced into the hobby as Gooch's Corals are still actively propagated and are in thousands of home aquariums. Like many we started off using liverock rubble As a retail store it was always available to us. But it always seemed to give us problems. It took up to much space and corals were always falling into each other. We began to experiment with other materials. All had to many drawbacks. Cement based plugs needed excessive cure time and after continually swapping out ro/di water just were not as cost effective as they seemed. Plastic was always getting flipped over and any random current would cause problems. We would have to almost constantly be turning coral fragments over or picking them out of other corals. About six months prior to closing our farm and retail shop we began working with ceramic. It colored up amazingly and we were seeing awesome growth with some corals encrusting the plugs in weeks. We were sold. Soon others began asking for our plugs. And The Alternative Reef was born. As you browse our site you will find information about our products. Helpful ideas on how to use them and a list of vendors and distributors that sells them. We are strictly a manufacturer. Our products are sold through our vendors and distributors. We have a few accounts that have been with us for years but all new accounts are handled by our distributors. We are confident you will find our site helpful in answering any questions you may have. If you still have questions feel free to contact us at info@thealternativereef.com. I sincerely hope our products help to enhance your reef-keeping experience. Thank you for your time.